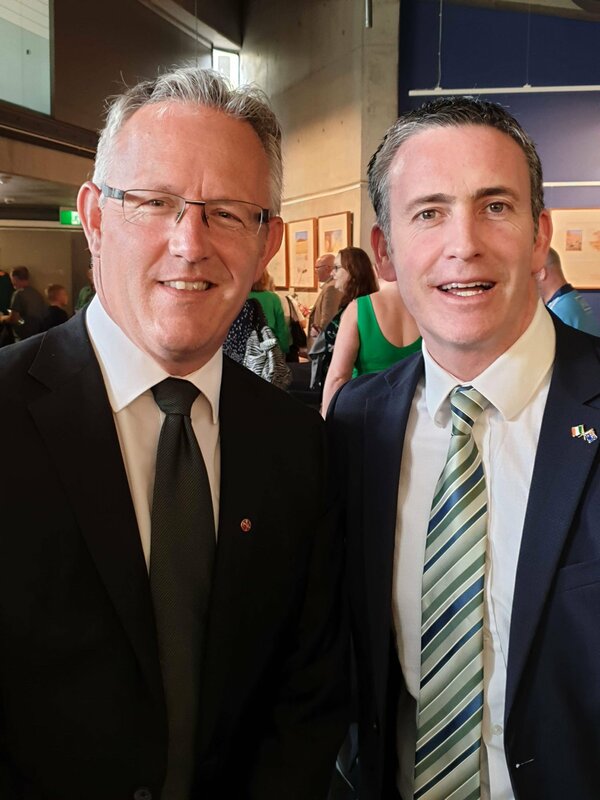 On St Patrick's Day, Sunday 17 March 2019, a full house at the Australian Centre for Christianity and Culture took part in the annual ecumenical service coordinated by the Canberra Friends of Ireland Society, with the Canberra Celtic Choir singing Hail Glorious St Patrick and Be thou my Vision! ACT Senator David Smith reflected on his Irish ancestry and upbringing in Australia in his address, and representatives from various Irish communities and local Christian churches and schools, and Irish Minister for Housing and Urban Development, Damien English, offered scripture readings and prayers of intercession. Left: ACT Senator David Smith and Irish Minister for Housing Urban Development, Damien English. Below: At the Australian Centre for Christianity and Culture on St Patrick's Day: harpist Madeleine Johnson, Rev David Campbell of Presbyterian Church of St Andrew, Bishop Pat Power, Bishop Stephen Pickard Executive Director ACC&C, Rev Alistair Christie of Uniting Church in Australia, Major Eileen Holley of Salvation Army, and Karen Brown, Coordinator of Christian Education in Schools.